The Business Secretary, Vince Cable, announced the development of a UK industrial strategy in September 2012. In the intervening two years the government has identified 11 sectors that should be given Government support and eight great technologies in which the UK should seek to be a world leader. In this wide-ranging review of the strategy, Glyn Gaskarth questions whether it is really up to the job of rebalancing the British economy and secure an export-led recovery. He warns that the objectives set out by Vince Cable are too easy to achieve and fail to address important issues that must be overcome if Britain is to secure an export-led recovery. “The limited programmes contained in the strategy thus far cannot solve the structural problems in the UK economy in terms of business underinvestment, poor productivity, poor public education, a substantial trade deficit and a weakened manufacturing base,” Gaskarth writes. 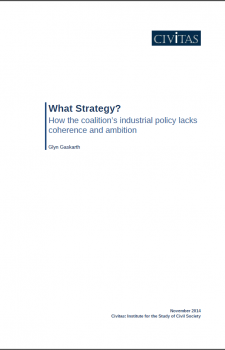 In a comprehensive study of the 11 key sectors that are the focus of the coalition’s industrial strategy, Gaskarth details what measures are proposed and what is left unanswered. Modest targets appear to have been “set to be easily achieved rather than to spur the sectors to succeed”, while funding is scarce and often repackaged. Glyn Gaskarth has worked for the Local Government Information Unit and the TaxPayers’ Alliance. Prior to this he worked for Accenture. He also served as a Special Advisor to then Shadow Home Secretary David Davis MP and as a parliamentary researcher for Oliver Letwin MP. He has a BSc in International Relations from the London School of Economics. His previous publications for Civitas include Gamekeeper or poacher? Britain and the application of State aid and procurement policy in the European Union (2013) and Growing Pains: How to restore economic growth and rebalance the UK economy (2012).